Darkness has its place, but not in an emergency situation. If you're in a storm cellar waiting for the end of the tornado, or stuck somewhere after an earthquake, you're better off not sitting in the dark. Once upon a time, we lived by the sun. When the sun went down, we all went to sleep. But now, we're just not wired to go to bed when it's dark. And, without electricity, it's going to be dark a lot longer than our biorhythms are accustomed to. 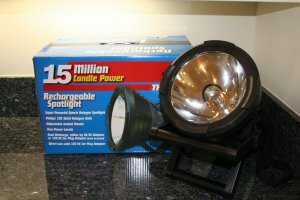 There is a wide choice of lighting available, everything from flashlights that require no batteries (all they need is a good shake) to flashlights that run on stored power from solar cells and have emergency radios on board. There are electric candles, propane camping lanterns (these need adequate ventilation but can be an excellent light source for semi long-term situations). 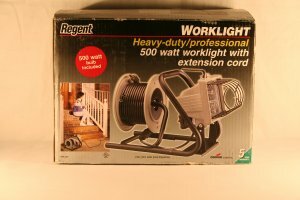 Of course, some of these emergency lighting solutions can be superseded by opting for our emergency generator. Everyone can use a good flashlight. A good flashlight fits your hand, is easy to carry, and has a reasonable life span. Some are designed to stand upright and provide room lighting. If your flashlight is battery operated, you need a significant supply of fresh batteries to feed it, or rechargeable batteries plus a solar-powered battery charger. 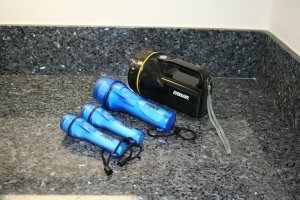 Flashlights can also be powered by pump action (squeezing), stored power from solar cells, a mainspring that you wind-up, or by being shaken. These are for a very short-term situation. These can be safely stored until it is necessary to use them; but after they are activated, their life span is very limited, usually measured in minutes. Strobe or emergency lights flash to command attention from the outside world. They are not so much for your benefit to see, but for others, so that you can be seen--or so that you can be found--or so that you can avoid being run over on a lonely road on a dark and stormy night. 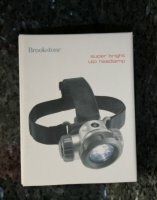 Any strobe you select should have high visibility. Pay attention to the color you choose. Colored lights might look festive in storage, but consider if lime green or hot pink is really what you want in an emergency situation. Remember that flashing red lights mean stop, and flashing yellow lights mean caution. You camping enthusiasts probably already have some Coleman lanterns squirreled away from your last camping trip. With adequate ventilation, camping lanterns are an excellent emergency lighting solution. Trademarks are the property of their respective owner.